New release for New Zealand – available from October 2015 at your nearest garden centre. Flower Carpet® Sunset is a bright tangerine coloured groundcover rose, one of the series of Flower Carpet groundcover roses first introduced in 1992 by Anthony Tesselaar International. Bred by Noack Rosen, the German hybridiser known for their early commitment to disease-resistant hybrids, Flower Carpet Sunset shares the impressive levels of disease resistance of its Flower Carpet cousins. Flower Carpet Sunset is a top-performing groundcover rose that blooms in profusion from late Spring through Autumn and, like its predecessors, exhibits excellent natural disease-resistance in the landscape. Flower Carpet Sunset has tangerine coloured single flowers, which fade over time to a light coral shade. Throughout the bloom season, Flower Carpet Sunset continues to look fresh with glossy green leaves unmarred by spent blossoms as its petals fall cleanly away after flowers have peaked. Simple to grow and easy to maintain, without any spraying or even fancy pruning. All you need is a pair of garden shears and then cut back, any-way-which-way, to 1/3rd of the bush size in late winter/early spring and you’re done. No guessing, No worrying, No Kidding. Masses of tangerine coloured blooms and glossy green foliage. Attractive bush shape and appearance. Bright, vivid presence in the landscape or garden. 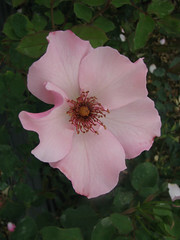 Flower beds, mass plantings, large containers, landscapes, hanging baskets, and as tree roses. A perfect commercial landscaping plant for low-maintenance colour. Bushes are low, dense and compact. As a mature plant, Flower Carpet® Sunset grows to 80cm high and 80cm wide. Medium sized (about 50-75mm across). Plant 2-3 per square metre, for ground cover. Plant 80cm apart to establish boundaries. Can be planted anytime during Spring, Summer or Autumn. Flower Carpet roses will thrive in all areas. 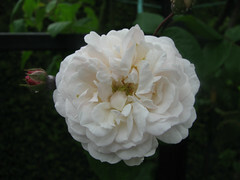 Flowering from late Spring and continues to late autumn. 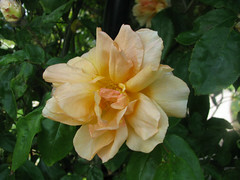 In full sun, a well-fed, well-watered, mature bush can produce up to 2,000 flowers per season. When mature, bears flowers in clusters up to eight-inches across, with each having up to 20-30 blossoms on average. Tangerine coloured single flowers, fading to coral. Dark glossy green, medium sized leaves. No fancy pruning needed. Cut back by 2/3rds annually in late winter or early spring. Trim to shape anytime of year, if desired. 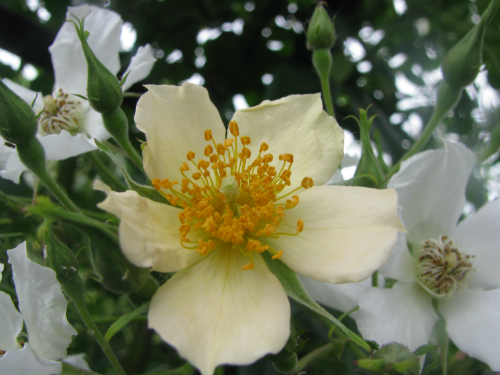 The bush is self-cleaning with few rose hips, no dead-heading required, petals fall away cleanly. For best bloom, grow in full sun. 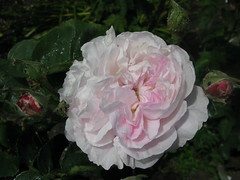 Grows well in partial shade (4-5 hours of sun per day) with reduced blooms. In areas of intense heat and sun, semi-shade/filtered light. Can thrive in a variety of soil conditions. Performs best in well-drained friable garden soil with added organic matter. When planting in the landscape, water in well particularly during hot conditions and continue to water regularly until the plant is established. 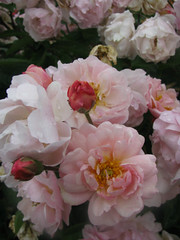 Flower Carpet roses are very tolerant of dry conditions once established. For maximum flowering and performance, feed with a balanced (15:5.2:10) controlled release rose fertiliser in early spring and again in late summer. For established landscape plants apply 1 to 2 handfuls around the base of the plant and incorporate into the soil by gentle surface cultivation. Very tolerant of common rose diseases such as black spot and mildew. It does not require routine chemical spraying in the landscape, apply only if needed. Treat for insect pests only as needed.